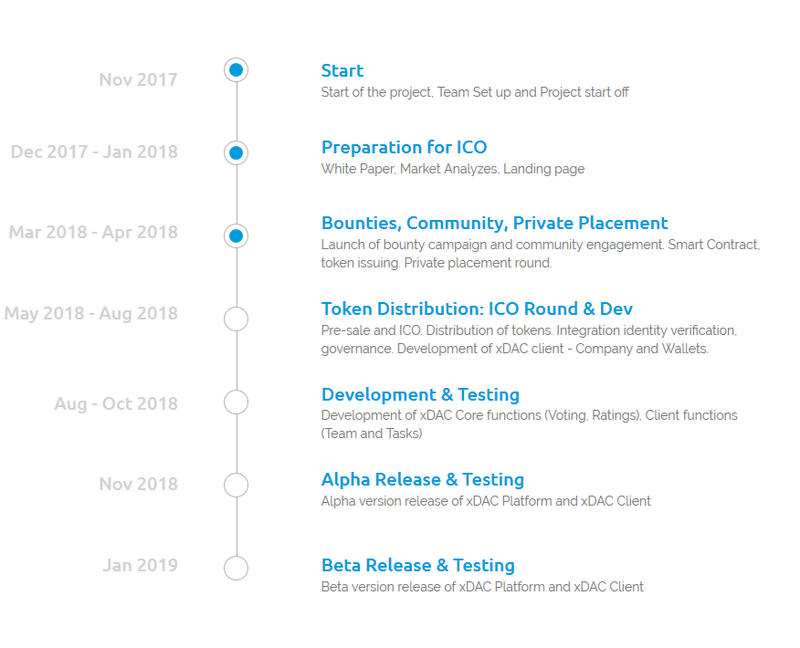 xDAC is an entity created and operated on decentralized digital ledger by one or multiple human or Autonomous Agent  owners or a mixture of both that share a common purpose and unites in order to focus their various talents and organize their collectively available skills or resources to achieve specific, declared goals. Decentralized company owns capital and other, primary digital, assets. It can also collaborate with other partners or businesses inside and outside of decentralized network – making it a highly versatile entity. Such a company exists as long as it is able to self-update its most basic components and continue being recognized as the same entity or until it decides to terminate its existence. xDAC companies can use an xDAC extension for better recognition in forms: Company name, “xDAC”, “Xdac” or “xdac”. Business is defined by three important components: governance, finances and workforce. In existing systems these components are separated and therefore highly ineffective. Companies are making every attempt to comply with laws, but in today's global marketplace, each customer can be regulated by different laws and companies are required to create network of branches across different countries. Finances are held by third parties, banks, payment processors or other financial institutions. Companies, therefore, are often forced to offshore their accounts to avoid jurisdiction issues. Paying employees require using third parties to process payroll from funds stored in third party institutions. In other words, companies have very little control over their business transactions and are wasting precious time and money on mundane tasks versus concentrating their efforts on managing their business operations. Company stakeholders are able to see the overall mission statement of a company but are unable to uncover the maze of jurisdiction issues, offshore finances and employees’ performances behind closed doors. This leaves investors and customers no recourse to initiate dispute or litigation. The normal procedure is to secure representation by way of retainer and lock in a court date; meanwhile a company can dissolve, and money transferred out of company accounts. This puts a potential investor in a difficult situation and leaves them exposed without proper arbitration. disputes, businesses have to deal with complicated negotiations or lengthy and expensive court hearings. Business success is being punished by higher tax rates, but taxes are not being used to stimulate their progress. In recent years a number of new projects were backed by ICOs on platforms like Ethereum. In most cases, they were not business platforms and do not provide any governance. Many of these ICOs have been identified as fraudulent and are designed to take advantage of investors. There needs to be a decentralized authority to re-establish investor faith by way of a systematic, unbiased arbitrator. Another problem xDAC is trying to solve is that people currently use cryptocurrencies mostly for speculation and trade on exchanges while converting from or to Fiat currencies. This is causing large volatility on crypto markets as there are no values being created within crypto ecosystem and people are forced to use exchanges in order to convert their wages into crypto or from crypto to spend their profits; therefore, exchanges are the weakest point of an ecosystem and easy to attack by hackers or governments. xDAC Platform aggregates three components together in one place, automates them, so system is beneficial for company and their customers. Companies have control over their governance, finances and their respective team. Business partners have confidence that companies they deal with are reliable and solvent by using a transparent system of governance and dispute resolution. An xDAC Platform is focused on creating a comprehensive framework for entrepreneurs, teams, autonomous agents or investors in crypto space who can benefit from decentralization. 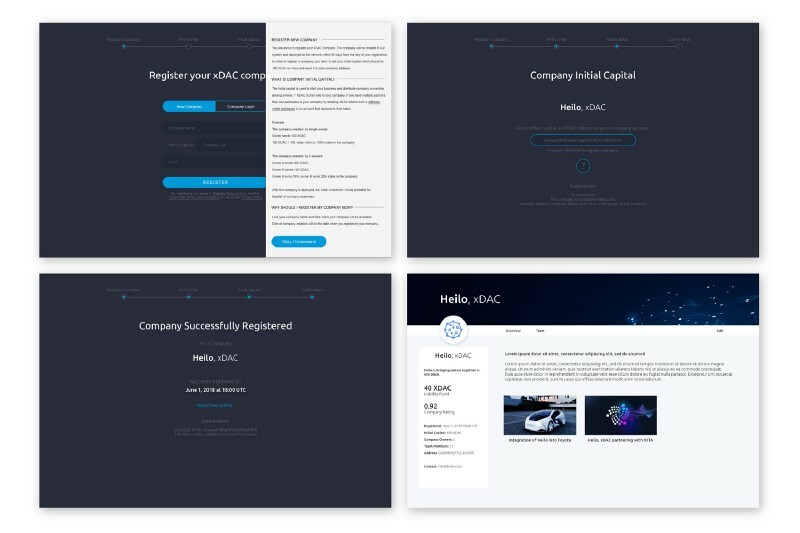 xDAC helps owners to operate a transparent decentralized company in front of their investors. Company owners can manage their team, tokens and financials, and securely store data on a decentralized ledger. Automated governance and dispute resolution will add to the speed of business evolvement and reward systems will make companies and their teams more productive, efficient, and motivated. Why customers trust xDAC more than traditional businesses? - Fast and automated dispute resolution: xDAC provides arbitration system for any given dispute between two parties which allows arbitrators to resolve dispute based on documents provided by applicant and defendant very quickly. - Liability fund that can cover company's debts or liabilities: Liability Fund is liability coverage in case of the xDAC's debts or liabilities. It is created as percentage from received payment that is stored on separate wallet until certain limits are reached. Why businesses prefer xDAC over traditional companies? Why support for Internal Autonomous Agents? Automation is a necessity in today’s fast-paced, digital world. The benefits of automation far outweigh the drawbacks especially for companies using 3rd party external services. Trading bots, SEO bots, or other subscription services are prime examples. If companies begin using services on other platforms, they have more difficult time managing their data and analyzing the efficiency of the service. Our goal is to encourage developers to create internal autonomous agents that are sophisticated enough to join company teams. This will allow for tailored solutions instantly measurable in-house versus relying on a third party services. Automated agents are paid as team members by performance rather than by subscription models that companies have to pay even when service end up being ineffective. 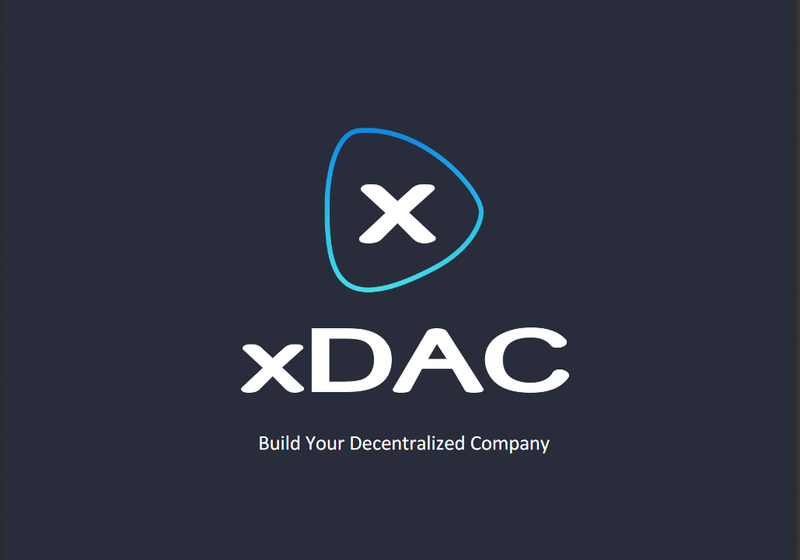 XDAC token is a platform currency representing value and wealth in the decentralized economy used for exchange of values between xDAC companies, employees, customers and other third-party entities. 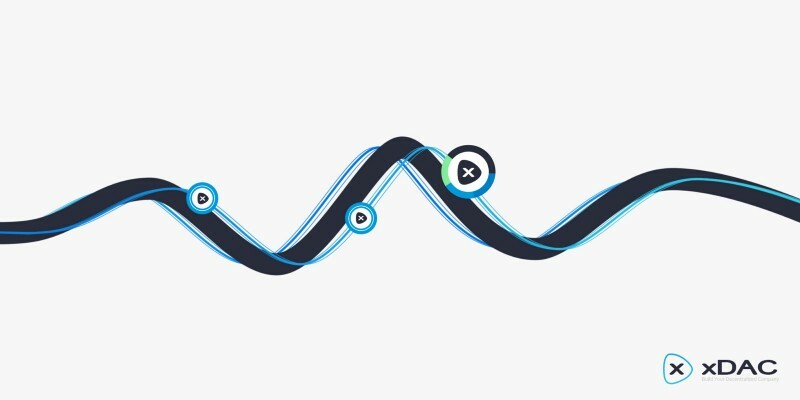 The token will be used on the xDAC Platform for dispute resolutions, pay team members, accept payments for services, profit distribution, and incentivize development. XDAC tokens are ERC-223-compatible tokens distributed on the Ethereum blockchain pursuant to a related ERC-223 smart contract. Ethereum tokens distributed in the ICO phase are pre-existing tokens and will be migrated to another protocol on the EOS platform. 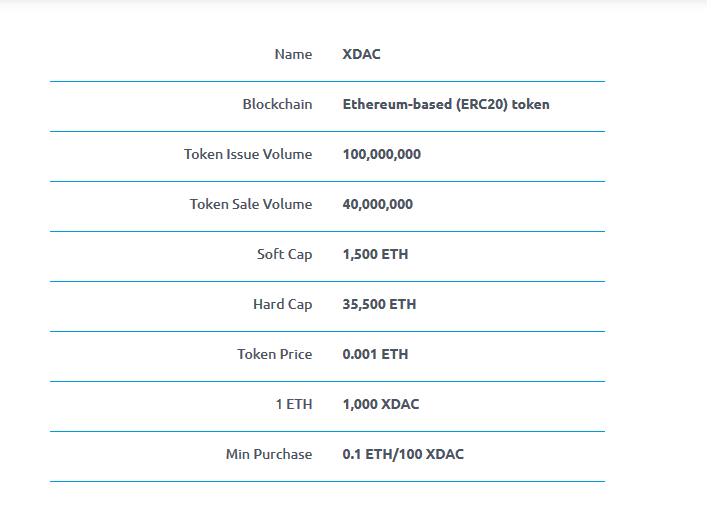 The Ethereum XDAC Tokens do not have any rights, uses, purpose, attributes, functionalities or features, express or implied, including, without limitation, any uses, purpose, attributes, functionalities or features on the xDAC Platform. 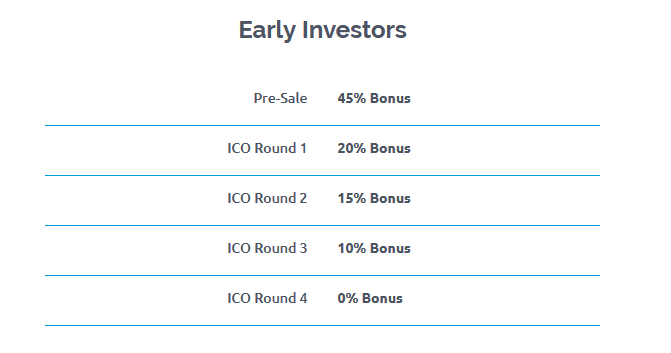 A token sale will distribute 40% of tokens within investors and 20% of tokens will be used to incentivize early adopters of the platform. The remaining 40% will be retained with the project team. 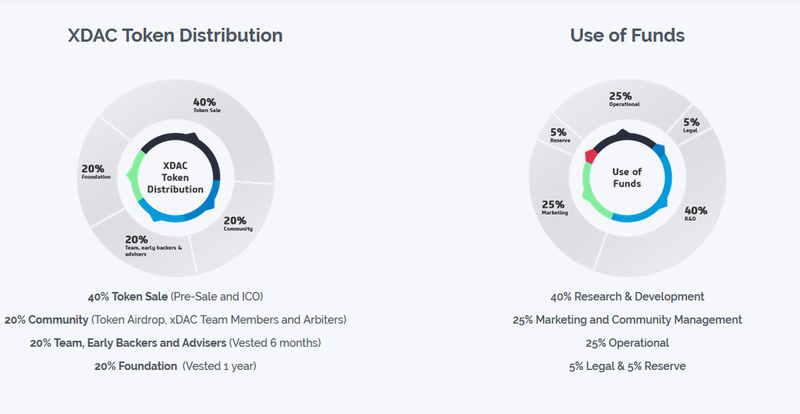 Proceeds from a token sale will primarily be used for R&D, operational expenses and marketing. Initially, we will focus on developing a reliable product. We project 2018 will be dedicated mostly to R&D. Starting in 2019, we will expand our efforts to marketing, development and building strategic partnerships. 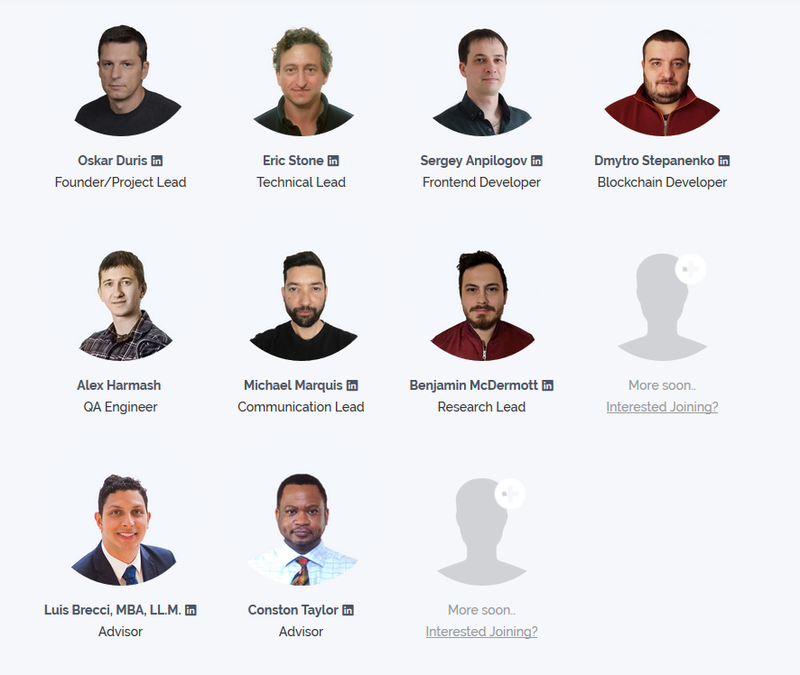 Core team has experience with building application for millions of customers. We are confident about our ability to bring reliable product that can serve businesses across the world. Thank you for your interest in an xDAC project. We are blown away by the incredible interest in our project. To date, more than 100,000 of people have joined our social media channels. We appreciate your engagement and would love to invite everyone to participate in our initial crowdfunding round. XDAC tokens will be available for purchase exclusively with Ether (ETH) from your ETH wallet. If you plan to participate in the XDAC token sale, we recommend acquiring ETH well in advance of the sale start date to ensure your ability to contribute. 4) Register on our website and upload verification documents to whitelist your ETH address. Referral Program: To invite others and earn up to 3% of their contribution, please log in to your account and get referral link in Referral Program. Thank you and we look forward to helping you build your decentralized company.